ROOM 3: King Christian IV died here on 28th February 1648. This room, together with the two preceding rooms, constituted his private chambers, and from here he had direct access to a toilet and a bathroom. During the reign of Frederik III and Christian V it probably served as the shared bedroom of the Royal couple. 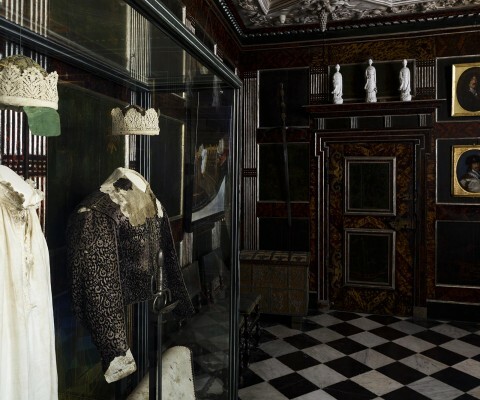 The items displayed in the room belonged to Christian IV. The wall panels and doors are from Christian IV’s time and originally had floral-painted framing. In the 1660’s Frederik III and Sophie Amalie, who were highly fashion-conscious, had the wall panels and doors painted in the “Chinese” style. The green lacquered panels bear gold line drawings, based on descriptions of China from the time and older Chinese novels. The stucco ceiling dates from the 1630’s. The ceiling paintings depict the gods of the earth, the heavens and the oceans. Abraham Wuchters painted the central painting: Hera – made to resemble Sophie Amalie – and Zeus on Mount Olympus. The other two were painted by Isaac Isaacsz. 300. Ebony mirror with rich silver ornaments, the Queen’s monogram, and the medallions of King Christian IV and his Queen, made by Nicolaus Svabe. 301. Table inlaid with silver and mother of pearl. Love scenes and allegorical representations engraved on silver plates (from H. Goltzius and D. Vinckboons). The silver plates engraved by Simon de Pas, c. 1624? 302. Christian IV. Half length, by Karel van Mander. 303. * Christian IV’s blood stained clothes from the naval battle of Kolberger Heide, 1st July 1644: a black and purple jerkin of silk velvet with a blood stained lace collar and cuff. Right shoulder pierced by bullet. * Cap of coloured silk with Tønder lace. Lining marked C 4 and 1642. Pierced by shot. * The King’s blood stained handkerchief, embroidered with C 4 1644. Embroidered cap of pale green satin; a piece of green taffeta has been fastened to it serving as a patch for the King’s blinded eye. * Shirt with lace border; embroidered with C 4 1644. * Rapier with silver-plated iron hilt. On the pommel: VHZSH (Ulrich, Duke of [Herzog zu] Schleswig Holstein, Christian IV’s youngest son). On the blade: Juan Martinez En Toledo Espadero del Rei. The Netherlands c. 1620-1630. * Pillow case with Tønder lace, blood-stained embroidered with C4. * A pair of eardrops in the form of enamelled white hands, which hold a piece of bronze and a piece of iron; fragments of a burst Danish cannon and a Swedish ball which were removed from the King’s forehead and eye after the naval battle of Kolberger Heide. Worn by Vibeke Kruse. 304. Christian IV on his death bed. Painted by Bernt Hilwaerts, 1648. 305. Chest with iron mountings bearing the intertwined names of Christian IV and Queen Anne Cathrine and the date 1599. 306. Two handed sword; on the blade, Christian IV’s name. 307. Chinese porcelain figures; placed in this room in the time of Queen Charlotte Amalie. 308. Prince Christian, the Prince Elect. Painted on wood by Karel van Mander 1642. 309. The Prince Elect’s consort, Magdalena Sibylla, born Princess of Electoral Saxony. Painted on wood by Karel van Mander, 1642. 310. Copper plate for the large engraving of Christian IV; engraved by A. Haelwegh from K. van Mander’s painting. 311. Duke Ulrik, youngest son of Christian IV (16ll 33). Painted on wood. Copy from about 1660 by Wolfgang Heimbach. 312. Queen Anne Cathrine and her eldest son, Christian, the Prince Elect. Painted by Jacob van Doordt, 1611. 313. Bone and amber model of Rosenborg. Made by Niels Nielsen, c. 1750. 314. Hedevig, Electress of Saxony, sister of Christian IV. Gilded brass plate, engraved by D. Kellerthaler 1606. 315. Leonora Christina, Countess of Schleswig and Holstein (1621 98), Christian IV’s daughter; wife of Count Corfitz Ulfeld, the Seneschal. Copy from the 19th century. 316. 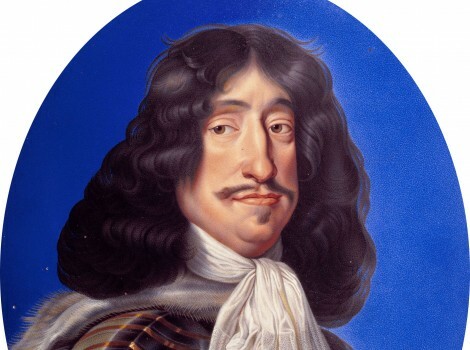 Christian IV, painted on wood by David Bailly c. 1627. 317. Casket with ink pad, and a seal bearing Christian IV’s signature in facsimile. Before 1645. Enamel portrait of Frederik III. Made by Paul Prieur, 1663. The portrait is a masterpiece, since the enamel’s melting point limits both the number of colours and the size of the miniature.